Aww, cute dog. How did you manage to get her to pose with the glasses, just say stay? Alot of dogs don’t care about glasses,aren’t bothered by them. Had my Husky wearing those large visor sunglasses before and he walked all over in them and didnt care. I’m Tim’s sister *waves* Nice to meet you, Kitch. So are Kade and Nicole’s sometimes-contentious relationship based on real life experiences? Dahan – Yes and no I can see bits of our personalities in Tim’s characters at times but they’re clearly (from my perspective) not meant to be exact copies. Ah, hello! It’s nice to meet the sister of one of my favorite artists! Do you sometimes help Tim with the comic? Er, I didn’t mean to turn this into a Q&A so let’s call this the last one ^^; I suppose I’m the test audience? Tim does bounce ideas off me every now and then, and I sometimes run a final grammar check before a new comic goes up. So I do help, yeah, but only in the background. Mandy looks like a kind dog. Although, I don’t think those are her glasses. This put a big smile on my face <3 she's so cute! Mandy and Auswren , welcome to Tim’s little online community! 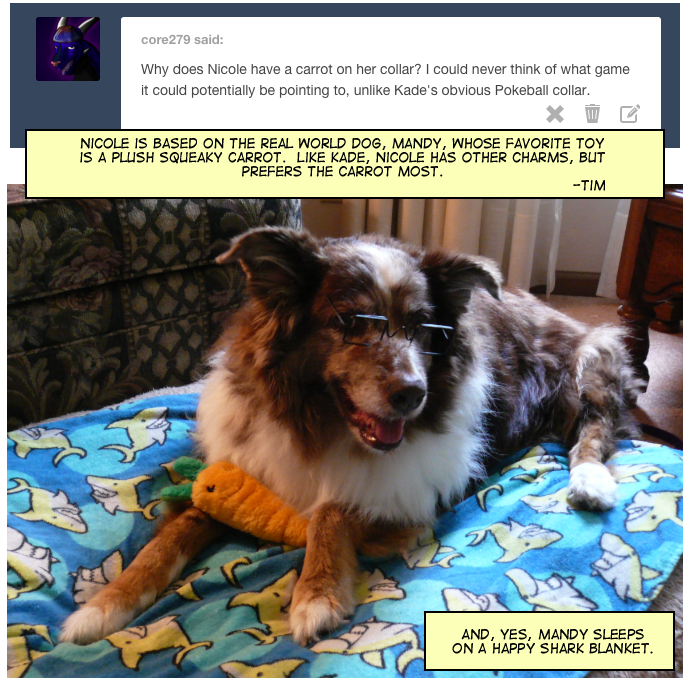 And ha, there will be no more mistaking Nichole for a dude, after this comic strip installment! I had thought that the carrot thing might be from the bolt movie, but if the dog is 14 that is before the movie. Which is cuter: the dog, the blanket, or the carrot? Cuz i have no idea. They’re all adorable!